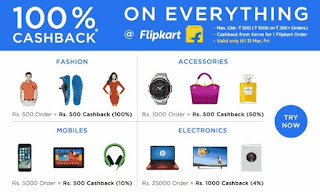 Get 100% cashback on Purchasing any Product from Flipkart through Xerve. Main thing is you can Transfer Whole Cashback to your Bank account!! So shop now to avail Cashback. Valid Till 31st March Only! How To Avail Flipkart Xerve Cashback Offer? • Done! Your 100% cashback will be credited witihn 72 hours in Xerve account. - Orders below Rs. 25000 = Rs. 500 Max. 02. After you Click-Out to Flipkart’s Website/App, PLEASE DO NOT VISIT ANY OTHER CASHBACK, COUPONS or OFFERS Website/App to ensure you don’t miss out on Xerve’s Mega Cashback. 03. 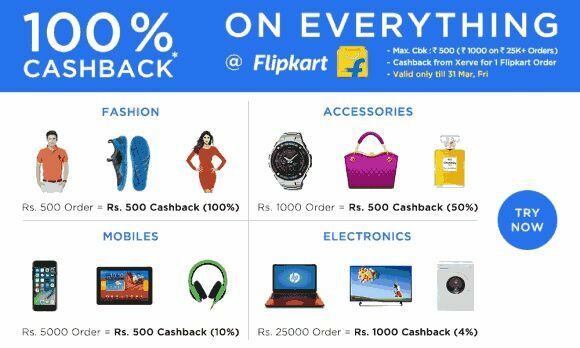 100% Cashback* is a Promo Offer of Xerve that is Valid only for One Purchase made at Flipkart (Below Rs. 25000 *Max. Cashback: Rs. 500 & Above Rs. 25000 *Max. Cashback: Rs. 1000). 04. Validity: Only till 31 Mar ’17, Fri (for each unique Xerve User/Account) | Not Applicable on Flipkart Gift Vouchers. 06. Cashback will be tracked automatically and credited to your Xerve Account within 72 Hours of Purchase. 07. Just in case you do not receive any communication from Xerve regarding your Cashback within 72 Hours of Purchase, please contact Xerve Customer Support:[email protected] with Proof/Bill of Purchase. Thank you. 09. You will not receive Xerve Cashback if you Cancel Orders and Place New Ones (unless you click-out again from Xerve to Flipkart’s Website/App after 24 Hours of your First Purchase).